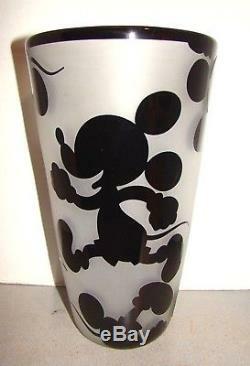 This is a beautiful Corriea art glass sand carved cameo Mickey Mouse vase for Disney. It is 11 1/8" tall and 6 5/8" across the top. It is in good condition with no chips or cracks. The item will weigh approximately 6 lb. The item "Correia Art Glass Sand Carved Cameo Glass Disney Mickey Mouse Vase" is in sale since Monday, April 23, 2018. This item is in the category "Pottery & Glass\Glass\Art Glass\Studio/Handcrafted Glass". The seller is "saphiremtn" and is located in Oregon City, Oregon. This item can be shipped worldwide.